As neck columns carry the load of whole building those should be constructed with caution. The column between footing and grade beam is called neck column. It’s also called short column. In today’s construction world almost all columns of a building are designed as reinforced concrete column and steel reinforcement is the backbone of any reinforced concrete member. In this post I’ll describe how to place steel reinforcement of neck column. Steel reinforcement also expressed as rebar or MS bar or simply rod. Whatever you call this I’ll call this steel reinforcement in this post. So that you don’t be confused. Column is constructed on footing. There are various types of footing. No matter whichever footing you are constructing column on, the procedure is same. In this post I’ll construct a column on a isolated footing. After learning this you can place steel reinforcement of neck column on any type of footing. Steel reinforcement of neck column is placed on the bottom reinforcement of footing. Some footings have two layer of reinforcement. One layer is placed in bottom and another layer is placed on top of the footing. Some footing has only one layer of steel reinforcement that is placed at bottom of the footing. Neck column’s reinforcement is directly placed on that bottom reinforcement. See the above image. There are 3 footing and 5 grid lines. See how the the footings are shown related to grid line. In structural drawings book there is a sheet titled footing layout. On that drawing you will find the details dimension for placing footing. In the structural drawing book there is also a column layout drawing sheet. On that drawing you’ll see how column is placed related to grid lines. Ok we studied the drawing. Now let’s start the work. In this post I’ll not discuss about how to place the footing reinforcement. I assume you’ve already placed the bottom reinforcement of footing. Now we’ll place the steel reinforcement of neck column. 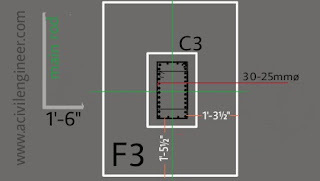 Let’s take F3 footing for example. In the image it is clearly showed that how the footing should be placed related to grid line and how the column is placed related to footing. In that we found that column is placed 1′-2″ and 1′-4″ inside from outer face of footing. Now follow the following steps to place the steel reinforcement of neck column. 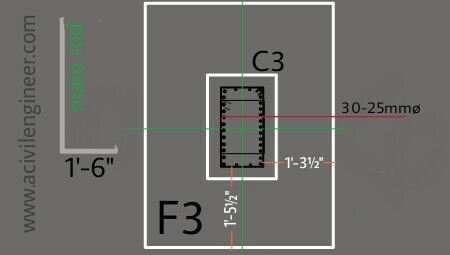 Make a stirrup of 1′-6½”x 3′-2½” size and place that on the bottom reinforcement of footing as shown in the above image. Here I would like to clear one thing that clear cover for reinforcement is 1½ for the column above ground. But it’ll be 3″ below ground. In that case the stirrup size should be 1′-5″x3′-1½”. But I didn’t make that size of stirrup. Why? Because I checked the column dimension for above floor. The column size is not changed for upper. In this case the column size for neck column will be 23″x43″ even that isn’t specified in the drawing. But the stirrup size will remain unchanged. To know more about the clear cover of reinforcement read the following post. Now check the dimension. It’ll be 1′-5½” from short face of column to short face of footing and 1′-3½” from long face of column to long face of footing. You can also use plumb bob to check the position of that stirrup related to grid line. Now place main reinforcement of column. For that you first have to bind the column’s main reinforcement with sstirrups in a separate place. The main reinforcement specified in the drawing (above image) as 30-25mmø bar for the column. You need to bind those main steel reinforcement with the column’s stirrups to make skeleton of neck column. The length of steel reinforcement bar we buy from the supplier is about 40 feet. You can’t place this so long bar in column. So, cut those rod at middle so that you can place them easily. You have to make 90 degree bend of 1′-6″ length at one side of each bar as specified in the drawing (above image). Now tie all the main reinforcement with stirrups in a separate place. Stirrup should provided as per drawing ( I didn’t shown them in the image above, you’ll find them in the column layout of structural drawing). After completing the binding process you can now place that column’s skeleton on the stirrup which we placed on the bottom reinforcement of footing in step-1. Now tie that column’s skeleton with the footing reinforcement. 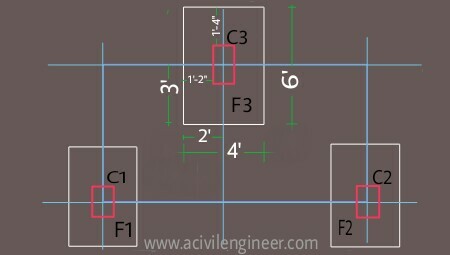 Again check the column position related to footing or grid line. 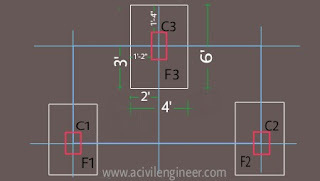 It is better to check the column position related to grid-line than related to footing. To keep the skeleton of neck column in its position provide enough support. Now you can move to next step that is shuttering of column. You can read the following post to know about the column shuttering procedure. Neck column positioning is very important because if it is shifted somehow your whole building will be shifted. So check the column position carefully. You saw the bend of column’s main reinforcements are spread outside. But now-a-days, some structural designers suggest that those should be placed in opposite direction. What do you think about that? Amazing content i need this info long time thanks for sharing.